Full disclosure: I’ve tried this particular cider before, but didn’t take notes at the time, so you’re not getting completely “pure” notes on this one. Ingredients: Heirloom & organic apples, organic cascade hops, organic cane sugar. No, that’s not a Strongbow glass. YOU’RE a Strongbow glass. Shut up. The Nose: Green apple, like pow! Faintly hoppy, but not overt. A little like fresh tree bark. A little sweet. The Mouthfeel: Light carbonation. Just discernable, like the kisses of an uptight angel. No roundness: carbonation and then tart/bite. The Taste: “More like an apple beer than a cider,” says Eden, that guy I’ve never before introduced in this blog and will give no further context to at this point. “This could be a beer with a granny smith apple slice in it” he opines. As for me, I get… tart, slightly sour apple cider with a hint of beeriness. It’s not particularly sweet (which isn’t a bad thing at all). I certainly don’t feel that it’s missing anything. The Verdict: I like it! This is the second time I’ve had Finnriver’s Dry Hopped cider and, to be completely honest, I wasn’t sold the first time. I’m not sure what changed for me between then (just before Christmas 2014) and now– but I’m on board this time. The hops are absolutely noticeable, and this does seem quite “beer-y,” but it doesn’t have any of the bitterness that I’ve experienced with beer. It’s a really solid offering, although I’m not sure I’d have more than one in a sitting because of the strong, distinctive flavour. Overall: 7.5/10 — a solid, well-balanced, very interesting cider. I’m always impressed and pleased with Finnriver, and this did not disappoint. Have you tried Finnriver’s Dry Hopped Hard Cider? What would you rate it? Tell me about your experience with it below in the comments. 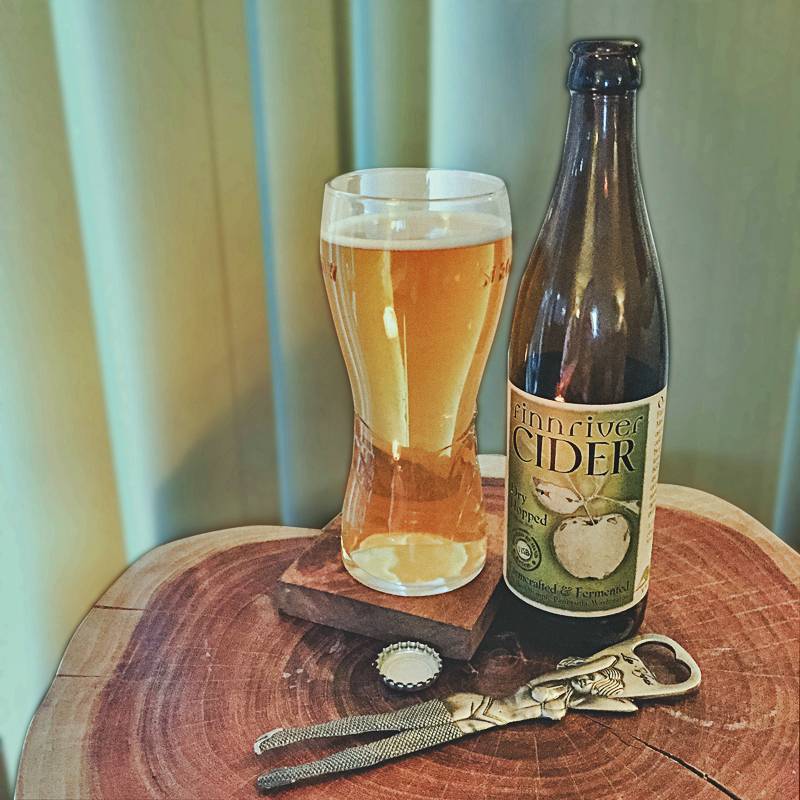 This entry was posted in Cider Review and tagged Apple Cider, Cider, Cider Review, Dry Cider, Dry Hopped, Finnriver, Hard Cider, Hopped Cider, Organic. Bookmark the permalink. Thanks for sharing your review! I’ve never been a fan of hops so I haven’t found any hopped ciders I’ve enjoyed, but I haven’t exactly been seeking them out. My favorite Finnriver so far is Black Currant (or Lavender Black Currant).